Stratocreed notched up career win number two from start five at Pinjarra on Thursday. Given a gem of a ride from Jason Brown, Stratocreed was too strong late in taking out the O’Neil Real Estate Handicap over 1200m. It was the son of Stratum’s first trip down the freeway to Pinjarra and started as a $9 chance in the class one race. Stratocreed was fairly out of the barriers and ridden along by Brown to take up a position outside Rebow who led the race. The pair kicked away at the top of the straight to fight out the race. Rebow held the lead until the final 100m when Stratocreed was too strong to salute in the famous Amelia Park silks. He won by a neck and there was a further one-and-a-half lengths back to third place which was Ramruey. It continues a stellar second preparation for Stratocreed who has now won twice and finished second in his other appearance. Harvey Racing also took Outlaw One to Pinjarra for his first up assignment. 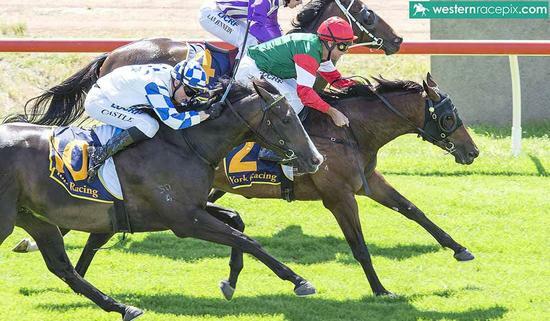 On a track that did not suit him on the day, Outlaw One made a pleasing return to racing by finishing seventh in the Sound Telegraph Maiden over 1200m.